Filmmakers Collaborative | Don’t Take That Receipt! Don’t Take That Receipt! 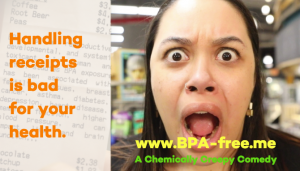 is a public health and environmental justice campaign based around a humorous 3 minute video about BPA in receipts. Our mission is to educate vulnerable populations — those who work in stores and restaurants – and the general public, about the presence of bisphenol-A (BPA) (and bisphenol-S (BPS) in receipts. We also provide tips and assistance for reducing exposure and creating systems changes that benefit the health of workers and customers. Our regional store-to-store outreach will focus on having face to face conversations with cashiers and store/restaurant managers, beginning in Holyoke this summer and expanding to regional towns throughout the fall, winter and spring. We will be providing bilingual tip-cards to cashiers and managers, and will be tracking and evaluating tangible steps that are taken to make employees and stores safer. Our online outreach to share our video and informational website will strategically reach Massachusetts-based nonprofits, environmental health groups, businesses, unions, schools, activists, cashiers, fast food workers, healthcare professionals, bank tellers, librarians, and customers, as they have a vested interest in understanding and sharing this information. Our social media outreach aims to garner over 100,000 views of the video in the state and nation-wide. Our online outreach in collaboration with our partners will also focus on two specific state and national corporations, TJX Company which has over 40 stores in MA and is headquartered in Framingham, and Target, which has nearly 20 stores in the state. Our joint efforts with Safer Chemicals, Heathy Families, Ecology Center, Green America, and Mamavation will engage the public to sign petitions and share social media messages to encourage these companies to switch to phenol-free receipts and paperless POS technology. An early adopter of these better protocols, in response to this group pressure, is Trader Joe’s, which also has nearly 20 stores across MA. We aim to garner regional and statewide print, radio, television, podcast, and online media coverage of our campaign and video, our messaging for how to reduce exposure, and our campaign success stories.